French mathematician and liturgical poet; born at Metz 1750; died at Bayonne April 9, 1839. He was destined for the rabbinate by his parents, but left Metz against his father's will, and traveled in Germany. In 1782-85 he was tutor in the family of Moses Mendelssohn, having special charge over the education of Abraham Mendelssohn. His work (manuscript) on integral and differential calculus was highly praised by Lagrange and Laplace, with whom, as with Monge and Berthollet, he was personally associated. On leaving Mendelssohn's house he returned to Metz, where he struggled hard to make a living by teaching mathematics. Being a Jew, he was rejected for the position of professor of mathematics at the newly founded Ecole Centrale at Metz. Ensheim was prominent in the movement instituted by the Meassefim. Filled with enthusiasm over the victory of revolutionary ideas, he wrote a triumphal song in Hebrew, which was sung (Oct. 21, 1793) in the synagogue at Metz, to the tune of the "Marseillaise," and printed in "Ha-Meassef." He was an intimate friend of Abbé Grégoire, whom he furnished with the documents and data necessary for his championship of the Jews. 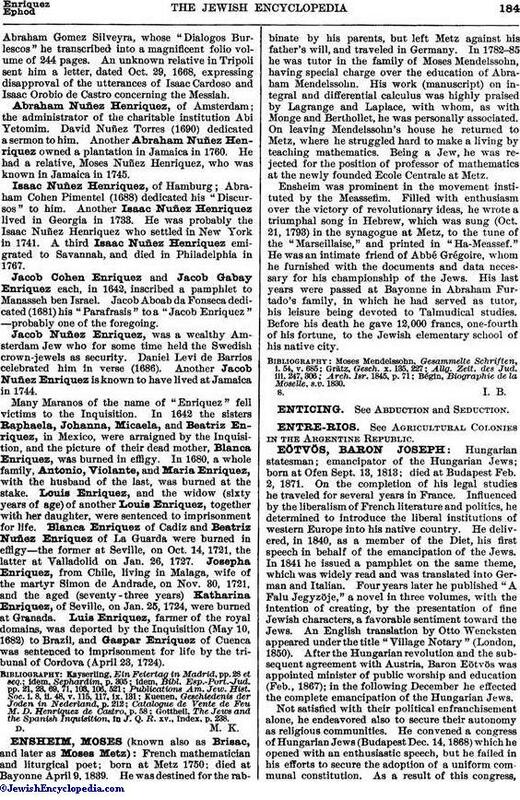 His last years were passed at Bayonne in Abraham Furtado's family, in which he had served as tutor, his leisure being devoted to Talmudical studies. Before his death he gave 12,000 francs, one-fourth of his fortune, to the Jewish elementary school of his native city. Bégin, Biographie de la Moselle, s.v. 1830.